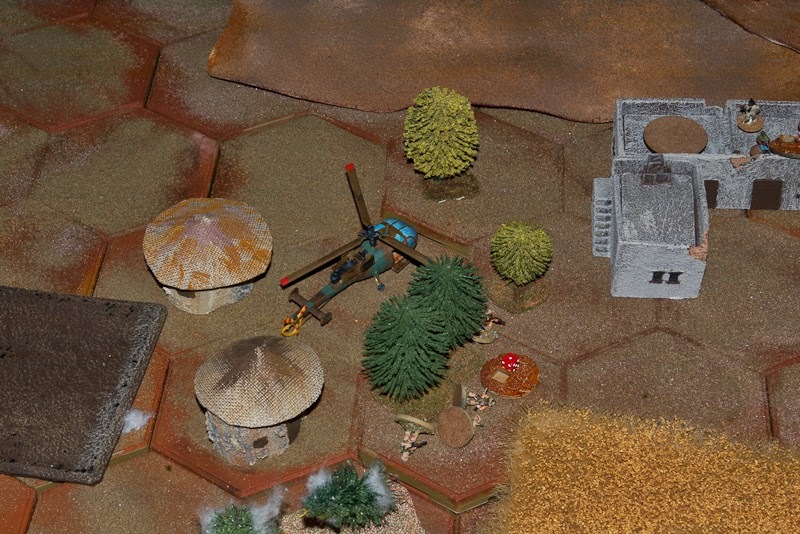 A RLI platoon consisting of 3 sticks (HQ and attached 3.5" RL, rifle and mg) and supported by a stick of Grey's Scouts and Alouette g-car were tasked with conducting a raid at a Frelimo camp as a part of larger operation. 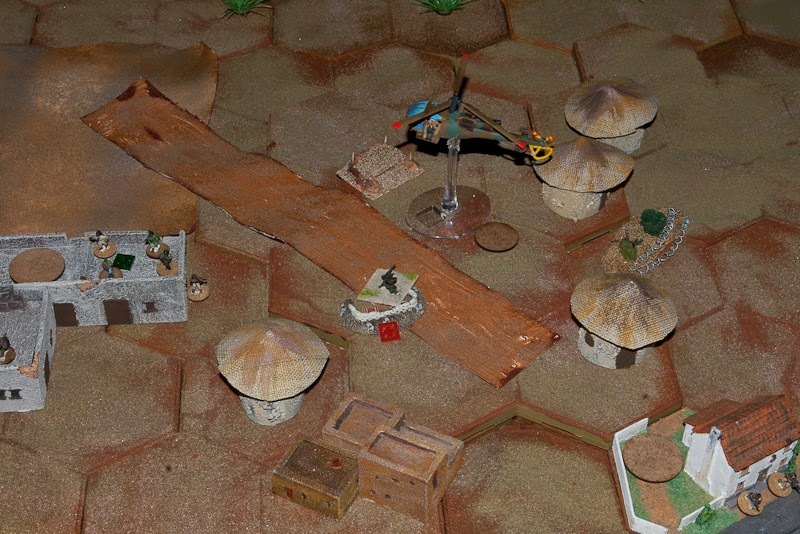 The camp was known to be guarded by some AA assets, but otherwise enemy composition was unknown. (We agreed that RLI would have a helicopter and insurgents at least some AA, for playtesting.) The camp itself consisted on an old missionary buildings (hard cover) with the other buildings being mostly of mud and straw (soft cover), one reinforced dug-in covering the road and parade grounds were also identified. The intelligence reports confirmed that inserted troops would be able to close in to camp reasonably easily and the tactical crest of the hill would allow good protection from the obvious guard positions. (Picture does not really show it, but the bottom side of white buildings is covered by large mounds of earth. 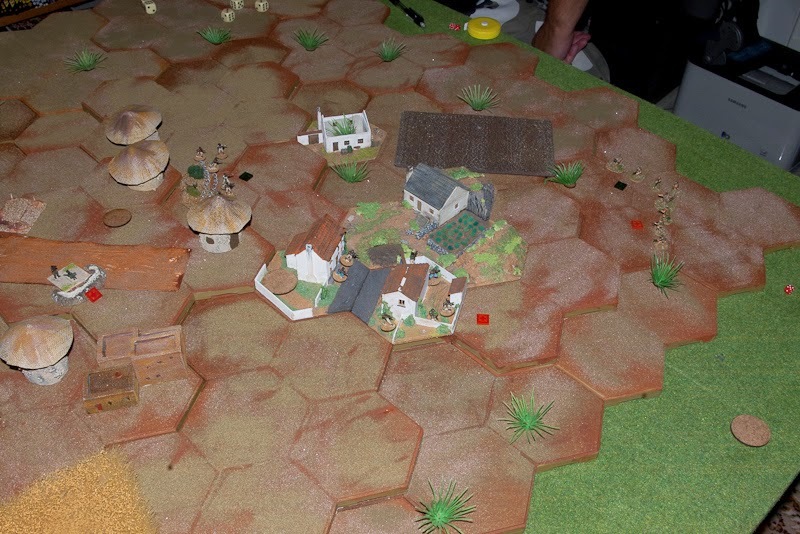 This was a very obvious entry point, so 2 sticks (mg+rifle) would act as a decoy, hoping to draw the enemy defence to the obvious place, while HQ stick would cover the other end of the camp with mg and rocket launcher, allowing Grey's scouts to flank enemy. G-car would act as a gunship support as soon as enemy positions were identified. The position after deployment and initial plans . JoPs in circles, filled red circles mark dispersal points and triangle marks the AA position. Decoy sticks went in without a hitch - mg formed a base of fire, while the rifle stick inched forward. The idea being to get close enough to shower enemy with grenades from behing the earth mounds, so they would either show themselves in open or try to close in - at this point first enemy section had already been identified in the missionary complex. They fortunately had only semiautomatic rifles, no lmgs or AKs, so closing in was an option. And has a short discussion when it is noticed that comms have been lost. Only one way, forwards! 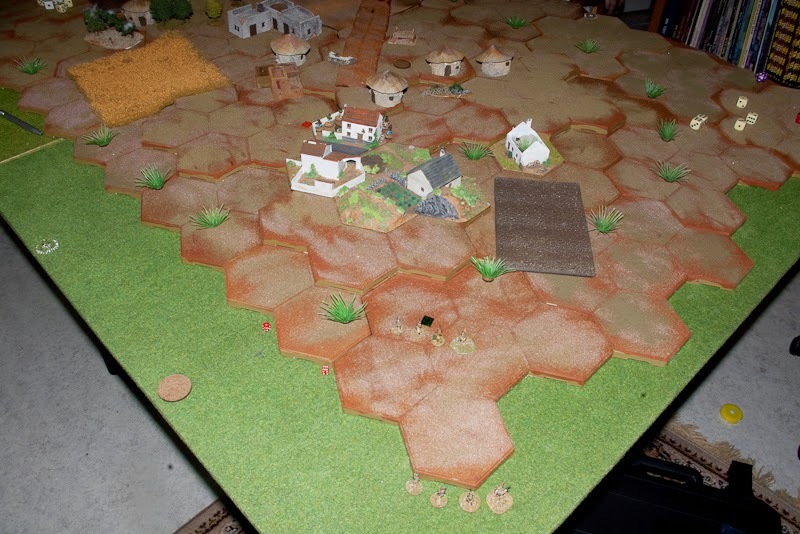 At this point the decoy sections noticed that they had no radio contact to HQ or g-car any more and enemy was taking the initiative, slowly tryingto surround them with another section, while heavy AAMG and recoiless rifle covered the other end of the village. More and more enemy appearing. 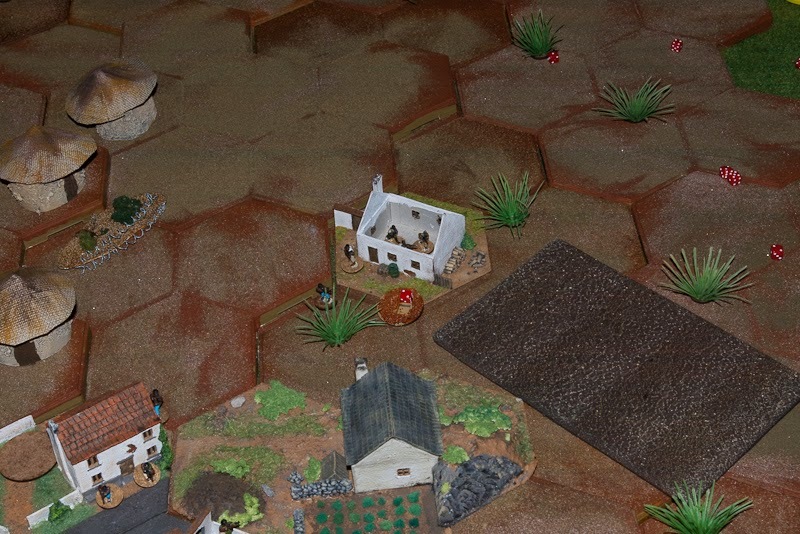 Enemy flanking movement seems probable, so decoy starts to take a defensive position. (Dice completely deserted me for a while, throwing mostly 1 and 4, so I could not active more than 1 stick at a time. So they just leapfrogged forward, biding time. At this point the defender made a mistake, showing himself to the mg stick and instead of firing, went to overwatch. The mg stick opened fire with 2 mgs at close range, and as expected the frelimo fighter started to suffer, even with their hard cover. The return fire took one man down, but medic was fortunately able to patch him up. At this point contact was established and HQ gave a go-ahead sign. 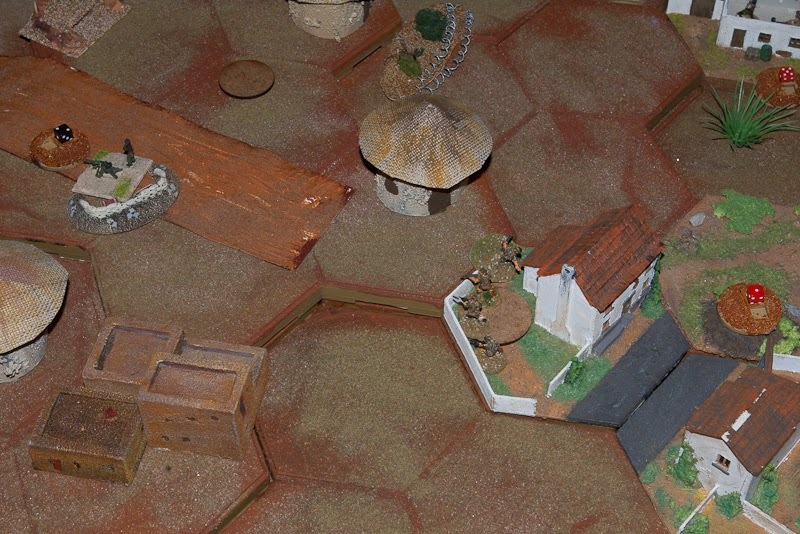 Rocket launcher and mg opened fire at the recoiless position on the roof of the stone building and cut the team down, leaving only the leader alive. Meanwhile the mounted Grey's scouts started the flanking movement and decoy troops went closer behing shower of grenades. Enemy return fire caused only light injuries. Comms re-established, Grey's scouts go in. On top of this, the g-car got the signal to suppress the enemy mg position. (In reality the situation was such that bringing helo in was a silly and needless risk, but we had agreed to air assets would be used.) So he swept in amidst tracers and swooped by the AAMG bunker, killing few crew members. A needless gambit in the name of testing. Baiting enemy with grenades, automatic weapons cover both approaches. Enemy HQ position was identified in the stone building and the HQ stickkept showering them with everything in hand. Meanwhile the Grey's scouts dismounted to flank the building. 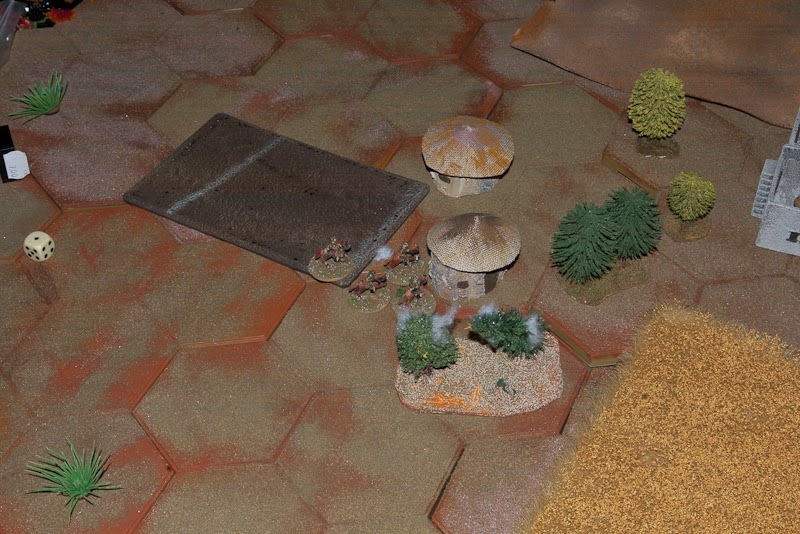 Unfortunately they came too close to the lone leader from destroyed recoiless rifle, triggering close combat. A lone sergeant with a makarov-pistol decided to sell his life dearly. 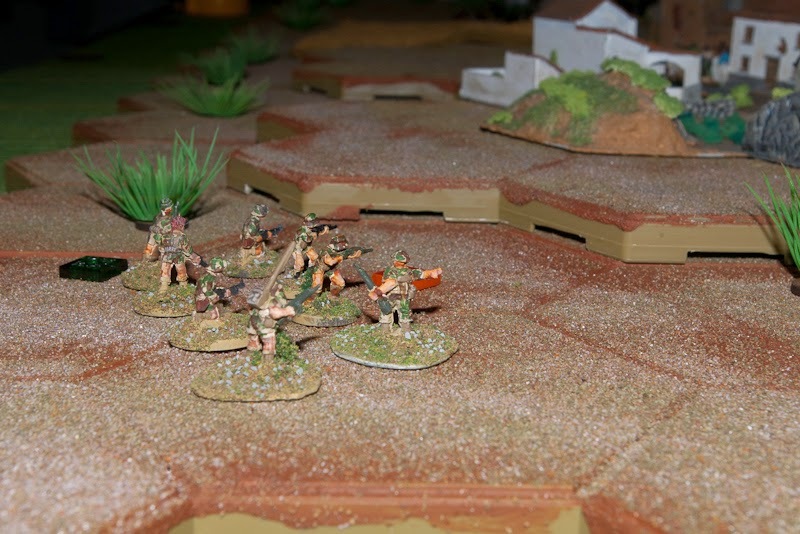 He took down 3 riflemen before the stick leader brought him down with a quick double-tap. 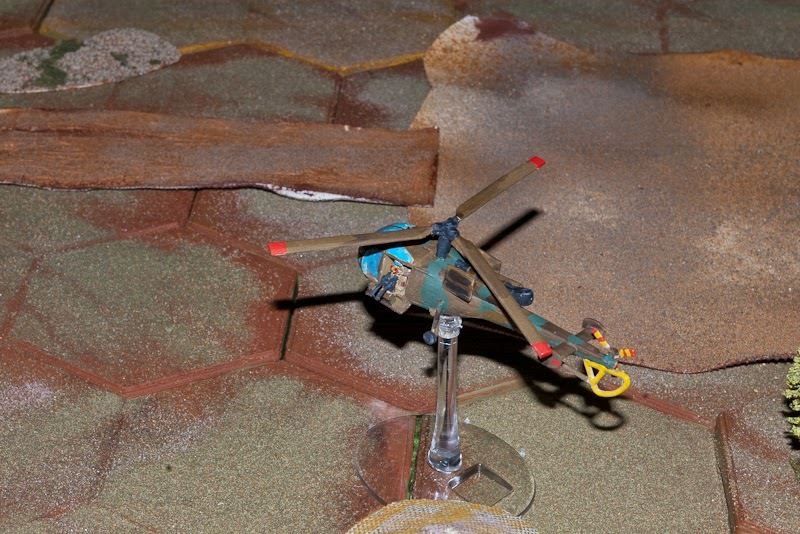 Suddenly RLI had 3 men down, so heliborne casevac was called in. G-car again managed to evade the aamg fire and landed in a tight spot to evacuate the wounded. Casevac called in. It really should have landed in the field, no idea what I was thinking placing chopper there. At this point frelimo morale was getting dangerously low, so he decided to risk a frontal assault. The mg stick had kept the head down from the flanking unit, so the section guarding missionary got the task - they already had some shock and casualties from grenades and were met with overwatch fire while closing the last meters, so the attack failed before it really started. Eliminate that aamg, chopper needs to lift off! 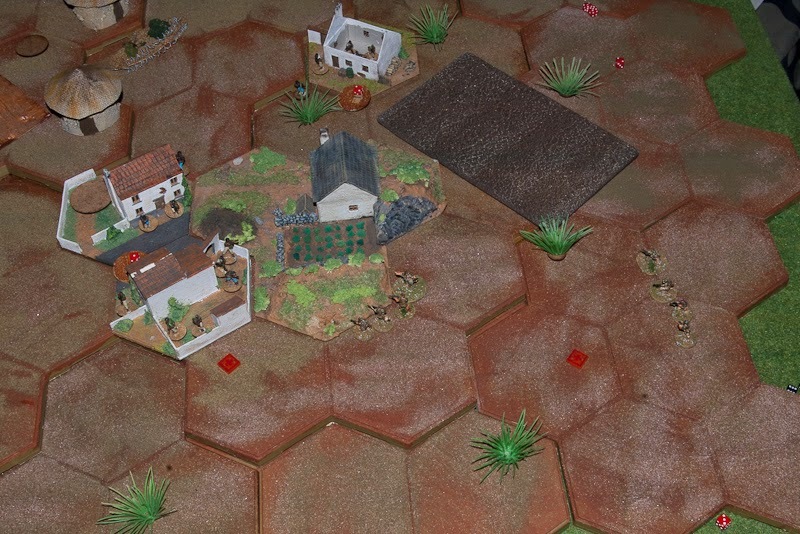 Hearing the distress calls from casevac, the decoy rifle team pressed on through the village and with another shower of grenades, stormed the aamg position. (2 consecutive phases for the the RLI in exactly right place.) Just as the wounded were carried to helo, point stick declared village center cleared, with one man wounded in the process. 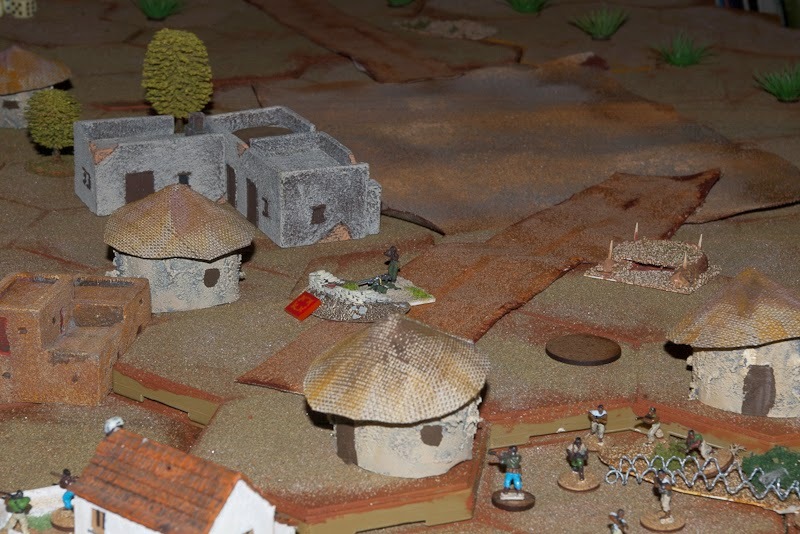 Frelimo morale had reached 0, so enemy withdrew to the bush.